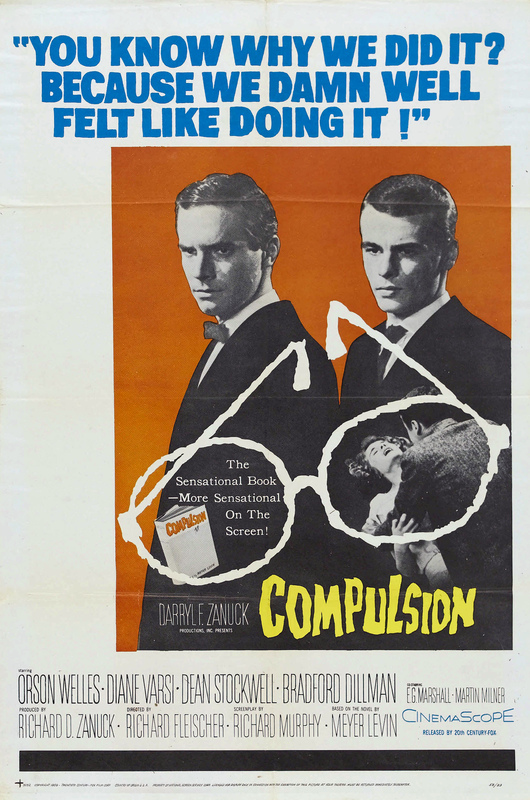 Brief Synopsis – Two spoiled aristocratic young men believe they are more intelligent than everyone else and can commit the perfect crime, but a small error leads to them becoming suspects. My Take on it – This is a film that presents and interesting idea yet it tells this story quite poorly . Alfred Hitchcock was able to keep the story much more interesting when he made Rope (1948) slightly more than a decade earlier. The story moves along quite slowly through the first half and even reaches points of boredom in the way that they tell the story. Thankfully, this film is slightly redeemed by the courtroom scenes during the second half which are more interesting to watch. I have always been a fan of Dean Stockwell ever since he appeared in the TV show Quantum Leap and it was nice seeing him in such a role from his early years. The actor tho who steals the show here is Orson Welles as the attorney defending the two main characters. Unfortunately his character doesn’t have more screen time, because even in the time he does have, he is quite impactful despite being just a supporting character. Overall tho, this film is too unbalanced and takes much too long to start becoming interesting. Bottom Line – Interesting idea, but I think it was done much better and more interestingly by Hitchcock more than a decade earlier. The story meanders along through the first half an even reaches some boring levels but rebounds a bit during the courtroom scenes. Nice seeing Stockwell in such a role, but the standout is clearly Welles who’s characters makes such an impact on the story even if he is relegated to being only in a very small part of the film.